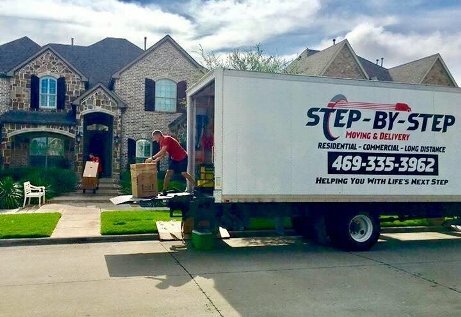 Step by Step Moving and Delivery is one of the top most moving companies in Frisco city since 2015 and is determined in providing excellent moving services at affordable rates and to give an enchanting experience to their clients. The company offers full fledge moving services and is bonded, licensed and insured which makes it to be considered as best moving companies of the industry. Be it, residential moves, business moves, long distance moves, or just packing, they are capable enough to do any service. Their highly professional crew members of the company make sure that customer belongings move to your desired location easily, eliminating all the struggles associated while moving. The movers will treat the belongings with great care and respect keeping in mind, about its value and feelings towards it. They will ensure that nothing will get damaged during the move and all the items will be carefully packed loaded and unloaded during the entire process. Contact them now to get a free quote about your move. Step-By-Step Moving & Delivery was established in 2015 and it’s a locally owned and operated moving company. They are very dedicated in providing personal attention to every customer to achieve a smooth moving experience. They take pride in ensuring the customers belongings while arriving at new destination without any damages. They take great pride in providing excellent customer service with a team of highly skilled, professional moving specialists who can handle the belongings with the up most care and respect. Rusty C. is the Business Owner. He took a chance to step up and start his own company, where his passion would be the driving factor! He is having 20 year career of leading, training, and motivating teams to grow business year over year.